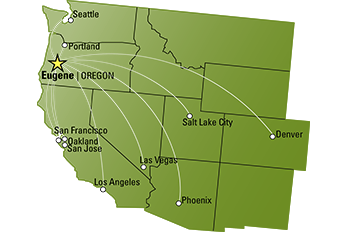 Fly into the Eugene Airport (EUG), Oregon&apos;s second largest airport serving six carriers from eleven major cities. Car rentals are available at the airport, or rent an RV in Junction City, just 15 minutes north. From Eugene drive to Crater Lake. 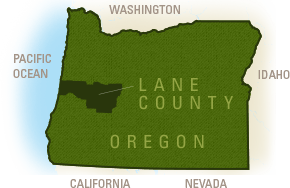 Amtrak Cascades and Coast Starlight service connects Eugene with west coast cities from Los Angeles to Seattle. Take the five hour train ride from Eugene to Klamath Falls, then hop on a shuttle to Crater Lake. Bring your bicycle along for some epic cycling around Crater Lake. There are no gas stations in Crater Lake National Park. The Mazama Camper Store in Mazama Village sells gasoline during the summer season but we recommend you fuel up in the small towns of Prospect (on OR-62 from Roseburg) or Chemult (on Hwy 97 from Oakridge). For GPS use the coordinates 42° 53&apos; 48.91"N 122° 08&apos; 03.08"W (Steel Visitor Center), or try "Crater Lake" as a town or waypoint. There is no physical address. Mobile phone coverage is spotty within and around the park. Eugene - Springfield is a great place to rent an RV or have your recreational vehicle serviced. Nearby Junction City and Coburg have been RV community-hubs for decades. The riverfront Armitage Park Campground borders Eugene - Springfield with easy access from Interstate 5. Klamath Falls - Route 97 north to Route 62 north and west to the park&apos;s south entrance. View the Annie Springs Entrance webcam. Crater Lake National Park Map - a great PDF map of the park.